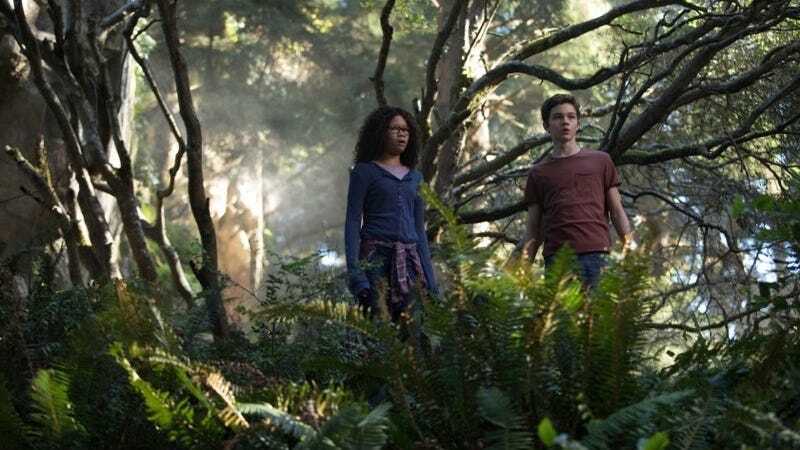 Meg (Storm Reid) and Calvin (Levi Miller) in A Wrinkle in TIme. Critics may have had mixed feelings about the new A Wrinkle in Time adaptation, but if it rules the box office this weekend, chances are Hollywood will consider making a sequel. The good news is there are already plenty more stories about Meg Murry and her family—but are any of them actually movie-friendly? It’s not a spoiler to say that Ava DuVernay’s film leaves the door wide open for more at the end, because Madeleine L’Engle’s much-beloved book does, too. A Wrinkle in Time, L’Engle’s most famous title, is the first in a series of four books, although they’re not exactly traditional sequels. On top of that, there’s a second quartet of books, published concurrently with the first, all about the epic’s next generation of characters. However. Though the movie makes some big changes from its source material, it hews to the original plot fairly closely—which might prove more of a challenge with these other books, none of which were written with prospective film adaptations in mind. (Oh, how times have changed.) At any rate, here’s a look at what happens to Meg, Charles Wallace, and the gang after A Wrinkle in Time. A Wind in the Door was published in 1973, a decade after A Wrinkle in Time, and as you can see from the cover, it was marketed as a “companion” to the first book rather than a sequel. That may explain why it barely mentions the interplanetary events of A Wrinkle in Time, though it picks right back up with the Murry family (drinkers of cocoa, eaters of liverwurst-and-cheese sandwiches) about a year later. Things are pretty much back to business as usual in Connecticut—Mr. Murry is gone again (on an actual work trip this time, fortunately)—but Charles Wallace has started showing signs of a worrisome illness. Also, now that he’s in first grade, he’s being menaced by school bullies, much like Meg once was. For her part, Meg’s grown a little more confident but is still her endearingly awkward self. Their supernatural adventures begin, of course, on a dark and stormy night. The siblings (but not their “normal” twin brothers, Sandy and Dennys, who were understandably written out of the already-overstuffed Wrinkle film) and Calvin O’Keefe (still Meg’s chaste sorta-boyfriend) meet a massive figure named Blajeny, a self-described Teacher, and his student, a feathery, dragon-like “cherubim” named Progo. They’re much like the trio of Mrs. in the first book, although somewhat less whimsical. The hate-filled villains this time are the Echthroi, creatures obsessed with nothingness who’ve been causing havoc both galactic (by violently extinguishing stars) as well as microscopic (by meddling with the cells in Charles Wallace’s body). Instead of flinging themselves across the universe, Meg, Calvin, Progo, and Principal Jenkins (Meg’s nemesis from Wrinkle, who plays an important role in this story) save Charles Wallace from within by shrinking down and doing battle on a level that’s both cellular and metaphysical. There’s a lot of psychic speaking without words (“kything”) and celestial singing—as well as a very charismatic but non-verbal snake named Louise. All told, and even with blessedly less Charles Wallace this time around, this very interior story would be hugely challenging to adapt. The story has progressed much further at the start of this 1978 book; 10 years after their Fantastic Voyage-style journey inside Charles Wallace and 11 years after vanquishing IT on Camazotz, Meg and Calvin are married. It’s (a dark and stormy) Thanksgiving night and everyone, including Calvin’s cranky mother, has gathered at the Murry’s house to celebrate—except for Calvin, now a scientist who’s been summoned overseas for an important conference. The Murry parents have a earned a Nobel Prize (though they’re still viewed with suspicion by the townsfolk); the twins are in medical and law school; baby genius Charles Wallace is now a teenager; and Meg, who’s knocked up with her first kid, has grown into a “lovely” woman at long last. But all is not well, of course. A buzzkill phone call from the POTUS to Mr. Murry reveals that the world is on the brink of a nuclear war, thanks to Mad Dog Branzillo, also known as “El Rabioso,” the hostile leader of the small but well-armed county of Vespugia. (His motivation has to do with America’s greedy overuse of the world’s energy and resources, which totally suits this L’Engle equivalent of a James Bond villain.) To save the world, Charles Wallace must travel way back in time and Quantum Leap into Branzillo’s ancestors, changing history and helping to transform the present-day South American dictator into a man who loves peace instead of war. Also, the Murrys get a new dog (RIP Fortinbras), the Echthroi from A Wind in the Door make a brief return, and Charles Wallace makes the fond acquaintance of Gaudior, a very helpful flying unicorn. A Swiftly Tilting Planet is a lot easier to follow than A Wind in the Door, though it does have certain issues. L’Engle’s way of writing about other cultures is a bit, ah, dated. Also, though the book checks in with Meg as she psychically follows Charles Wallace on his quest, he’s the main focus of the story here. And frankly, despite all his gifts, he’s nowhere near as interesting as Meg—though his exploration of Calvin’s family history, once their surprising connection to Branzillo is revealed, adds some depth. A film adaptation would certainly be tricky... though the idea of a unicorn helping to save the world from nuclear destruction is pretty badass. This book focuses on Sandy and Dennys, the least-interesting Murry kids. Many Waters came out in 1986 but it takes place after A Wind in the Door, when the twins are teens. One snowy day, their desire to transport someplace warm leads to the accidental disturbance of one of their mother’s experiments... landing them smack-dab in the desert, where they realize they’re special guest stars in the story of Noah’s Ark. The twins meet unicorns and manticores as well as helpful angels and seductive fallen angels (and their equally seductive human wives); they have adventures, fall in love (awkwardly, with the same girl), get dangerously sunburned, and just generally come of age. They make it back before the flood, and the last word of the book is “cocoa.” Look, even if Sandy and Dennys had been included in the recent film... nobody cares about these guys. They’re boring no matter what, but they’re even more boring in the context of being the only two normal dudes in a family of eccentric brainiacs. Many Waters is not movie material. Published soon after L’Engle’s Wrinkle in Time success, 1965's The Arm of the Starfish is set a few decades after the first book and is much more of a thriller than a fantasy adventure. Now well into adulthood, Calvin has achieved great scientific acclaim, but his research into organ regeneration has attracted the interest of some seemingly nefarious parties. His eldest child, 12-year-old Poly (short for “Polyhymnia”), gets caught up in the intrigue, as does one of Calvin’s students, but there are no interplanetary jaunts, time travel, or magical beasts in this one. In case you were wondering what Meg’s been up to... well, Poly is the oldest of seven children. So there’s that. Some characters from Starfish also appear in L’Engle’s series about the Austin family (the most popular of which is probably A Ring of Endless Light), but the O’Keefe story continues in 1976's Dragons in the Waters. Sorta, anyway. Calvin and Polly (as she’s now spelling it) are mere peripheral characters to the story of fantastically named orphan Simon Bolivar Quentin Phair Renier, who gets caught up in a murder mystery, among other complications, while taking a family trip to the jungles of Venezuela. In 1984's A House Like a Lotus, 17-year-old Polly travels to Greece to both escape and reflect on the drama in her life (none of which is scifi or fantasy-related); several familiar characters, including her favorite uncle Sandy, show up along the way. Finally, there’s 1989's An Acceptable Time, which is sometimes packaged with the first four books since it connects back to them in many ways. It picks up about six months after A House Like a Lotus, though this time—while spending time with her grandparents in Connecticut, where strange things tend to happen—Polly finally gets a proper science fiction adventure. After traveling 3,000 years back in time, she (of course) becomes entangled in an ancient conflict that manages to eventually help work out using the power of love. Still no sign of the long-gone Mrs. Whatsit, but human sacrifice is a plot point. So there’s that.